Ooh... why do I had to become a grown-up? Ooh... when had I became a grown-up? Played around, and then slept because I was too tired? NOTE: Transliteration from various lyric site while the translation is done by your truly, cross checked with a native translation from the local manga adaptation. Great gracious, here we are... at this time of the year... ^o^. A new month, the end of the year... it's DECEMBER already! As I have mentioned on the last post, the theme for December is a combination of three: Memories of the Past, Wonders of the Present & Resolution of the Future or to put it kanji-cool: 過去の記憶 x 現生の驚異 x 未来の覚悟 (read: Kako no Kioku x Genshou no Kyoui x Mirai no Kakugo). The songs I will put to the headlines during this month, will show and depict my feelings among those 3 sub-themes, perhaps one, perhaps two of them, or all at once. As all other Sensei's songs that were used in the show, this song has significant value and captured the essence of the story itself so poeticly fitting. 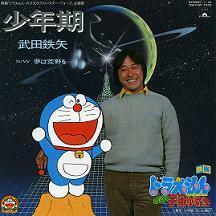 In this movie, Nobita, Doraemon and the others, met a 'small' president from the Planet Pirika, by the name of Papi (voiced by veteran seiyuu Keiko Han). 'Small' as in the a small 'elf'' size compared to human, and the fact that he was only 10 years old but have a huge burden of leading his planet. Under the attack of the evil tyrant General Gilmore who was trying to take over his place, against his will, Papi was refuged using a small spaceshuttle by his followers and canine partner -the chatterbox- RocoRoco (voiced by Yuuji Mitsuya) to avoid public execution, thus landed on earth. The evil guys chased him to earth. He quickly became good friends with Nobita, who eventually volunteered to help him. The gang went to Pirika to re-proclaimed Papi's government's rights in a huge 'little space wars' battle utilizing Suneo's army model kits. Have I watched this movie? Nope... it's an old movie, that I couldn't get a hand on. How did I able to tell the whole story then? Simple... I have the official manga version of it, translated in my native language... and it's one of my past collection since 1995. I had to dug out my old comic-book collections to get this one book out, and re-read it to write this review. Damn, it's still a treat and a wonderful reading materials even after all this years, especially since the original author Fujiko F. Fuio was still personally in charge for this manga ^o^. An important connection to today's post, is that the lyrics of this song, can be found in that manga as well. That was probably the first time ever I heard Takeda-sensei's name (though it was typhoed as Tetsuda Takeda -_-) in my life, and showed how well crafted the relationship between manga, the theme song and the movie itself. The song depicts the emotion and inner feeling of Papi, as well as Nobita and the gang who are 'forced' to do more than their age in times of trouble. It is speaking about the feeling of a man (yes, this is a very manly song), who is recalling his time as a boy. Lots of experiences that he remembers, and the world was a very intriguing place filled with enchanting mysteries. Everything was very peaceful and comfortable, that he finally questions a very simple but deep question: "Why do I have to grow up? When did I ended up as a grown up?". You won't be asking about this question if you're in the stage of a boy, or teenage, but as you finally reach the stage where your mindset and life challenges are those of a grownups. Of course because it was produced 26 years ago, it sounded classic. Singing this song is like telling a story with music... it's a mixed type of ballad and japanese folksong, so if you liked traditional Japanese, you'll like it (you know I do right? ;p). That was the biggest challenge I had while doing the song, cause I feel like I'm narrating a personal story but in an arranged melody. Singing this song is just like giving speech, and it took me a while to get a hang of it since I've always been awful in speaking Japanese compared to singing. You need to put a certain amount of feeling/emotion, because it would ended up as flat and heartless if you don't. It's a real challenge for me, but I tried giving my best, and I do feel it's worth it -eventhough it could've been way better-.